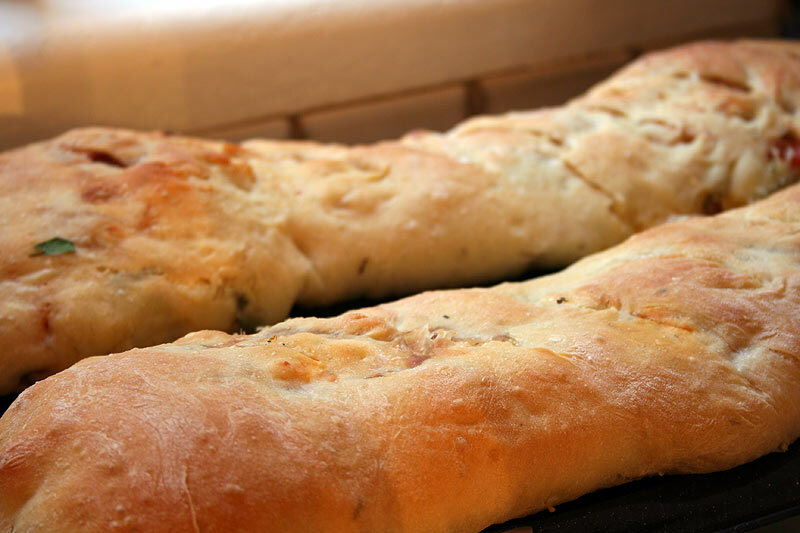 Tonight we ate homemade stuffed bread, with a rosemary-thyme dough. One loaf was filled with salsa turkey, salami, jalapenos, tomatoes, cilantro, and pepperjack. The other loaf was filled with smoked mozzarella, feta, pepperoni, roasted red peppers, and parsley. T: man, Amanda, you always hook up awesome stuffed bread. Tonight was no exception. A: you are too kind mista tyler. the loaves were tasty tonight although one of them looked quite mangled after I fought with the dough while stuffing it. A: hehehe i do believe that’ s what she said. Breads are just so damned good, its really hard to make a bad one. people just think they are too complicated to try. not really. T: They seem pretty involved to me. The air temperature has to be a certain way, the yeast has to do this that and the other thing, if you mess up at any point you will end up with something resembling a stone. That’s a bit much for me. I think I’d be buying a bread maker. A: hehehe i have rarely seen bread end up looking like a stone (except the second time i made biscuits from scratch and added like two tablespoons of both baking powder and soda, cause I had lost the recipe and thought i would just try it out. – those were bad). T: Yeah, heheh, we couldn’t even bring ourselves to feed them to the ducks. Oh, well, you’ve made nothing but killer biscuits since then. A: hehehe thank goodness I started using whitelilly self-rising flour. the baking powder and soda are already added…they make it pretty much fool proof. T: cool. is whitelily available at most grocery stores? A: definatley in the south it is, but i’m not sure if i’ve seen it around here. it really is the secret to making good biscuits because it’s got a lower level of protein than other all-purpose flours do. thus the biscuits are less dense and more fluffy. wooo hooo.. fluffy biscuits. Maybe they have whitelily at specialty stores here in san diego. T: that’s crazy. yeah, fluffy biscuits are the bomb diggity, yo. … back to tonight’s bread. I give it a 4.4/5. It may seem like a low score compared to a lot of the scores I give out, but I’m leaving room for other breads to conquer it. As good as this bread was some of your other breads have had more enchanting ingredient combos. A: true dat. I give the breads a 4.236/5, they were good. i could have eaten both loaves (except i wasn’t that hungry) but it’s hard to give bread a high rating unless it is really the ultimate, and like you said, there is definately room for improvement. T: does that mean we will be eating more bread in the not-to-distant future? First add honey and 1 tbsp oil to 1/2 cup warm water (about 105-110 degrees). Stir until honey is dissolved then add yeast. Set aside for about five minutes or until the yeast concoction has become frothy and active. Meanwhile mix dry ingredients (including herbs) in a well-oiled bowl. Add wet mixture to the dry mixture while stirring with a wooden spoon. Continue to stir in another cup to cup and a half of warm water to the dough until most of the flour is incorporated and dough feels slightly sticky and moist. Turn dough out onto a lightly floured surface and knead for 5-10 minutes until the dough is nicely elastic. If the dough is too wet simply add more flour during kneading. Place kneaded dough into a lg oiled bowl and cover with either oiled plastic wrap or a kitchen towl and place in a warm draft-free area. Allow the dough to rise for 1 to 1 1/2 hours or until it has doubled in size. Preheat oven to 400 degrees. While the dough is rising prepare stuffing, I used julienned roasted red peppers, smoked mozzerella, feta, parsley, and pepperoni. If you use a meat like pepperoni (aka full of fat) it's good to render some of the fat out first either in a skillet or microwave. Separate the dough into two pieces, re-cover one piece and turn one piece out onto a lightly floured surface. Using your hands work the dough into a wide rectangle. Evenly spread out stuffing over rectangle, then roll the dough up, making sure to fold the edges in and seal all the edges. Place the loaf on to an oiled cookie sheet or floured peel and cover. Repeat with second portion of dough. Allow to rise for another 45 minutes then bake for 25-35 minutes or until the loaves look brown and crusty. Let cool for 15-20 minutes, then dive in with reckless abandon. Enjoy, and remember- practice makes perfect, but even imperfection can be damn tasty. The bread looks fantastic – I’ll definitely be making this one. Thanks Cate! 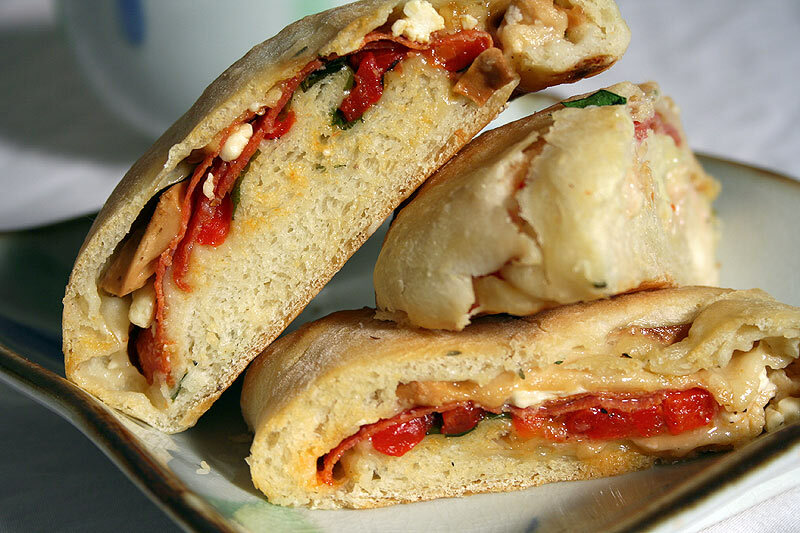 The fun thing about stuffed bread is that you can put whatever you want inside, so it’s endless possibilities. I am trying to make this bread today and I am going to follow the recipe religously this time. I will let you know how it come out. We just had some homemade bread, and it is so good. Instead of stuffed bread, I just made the bread and put garlic sauce and olive spread on top and it is delicious. Thank you so much for the recipe. keep up the good work. Yi, I’m so glad to hear that the bread worked out this time! It’s definately gratifying to hear someone has followed your directions and voila! tasty things occured. Thanks for the feed back! I’m writing a blog on homemade hot pockets that I’ve adapted from your stuffed bread recipe and have given you full credit for the original recipe, plus linked your recipe to my page. Is that OK? I’m a new blogger and I’m not quite sure of blogger etiquette. I can always take it off if you wish. By the way, the hot pockets adapted from your recipe turned out WONDERFUL! Absolutely! As long as proper credit and links are provided I have no problems with blogging about it. It’s actually great that you took the time to ask me and wonder. Most people would have just posted away without a second though. Can’t wait to see your post!